Mary Oliver has published fifteen volumes of poetry and five books of prose in the span of four decades, but she rarely performs her poetry in live readings. Now, with the arrival of At Blackwater Pond, Mary Oliver has given her audience what they’ve longed to hear: the poet’s voice reading her own work. 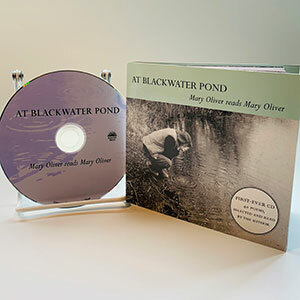 In this beautifully produced compact disc, Mary Oliver has recorded forty of her favorite poems, nearly spanning the length of her career, from Dream Work through her newest volume, New and Selected Poems, Volume Two. The package is shrink-wrapped so that the elegant clothbound audiobook can takes its place on the poetry shelf. It also includes a fifteen-page booklet with an original essay, “Performance Note,” photos of the author at Blackwater Pond, and a full listing of the poems and their sources. "The CD is housed in an elegant little cloth-bound book. . .Oliver reads 40 poems, all about nature and its wonderful creatures, in a sweet, neat, compact voice. 'The ear bone,' she says in "Bone," 'is the portion that lasts longest/in any of us. . . .' This little collection, resonant with her voice, is a tribute to it." "In clear, crisp studio sound, Oliver's voice comes across insistent and calming. Released just in time for National Poetry Month, this CD makes a good introduction or companion to Oliver's accessible work and an inviting gateway to poetry for newcomers."